Yes, the testing, the feedback, the final editing are all done! 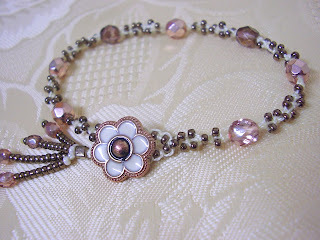 I have just listed this tutorial (in either paper copy or eCopy) at My Etsy Shop . I also listed a few kits of materials for those of you who just want to try one out. There will be more kits as I put them together and get them photographed. I am listing tutorials separately from kits for a couple of reasons. One, the category system in Etsy requires commercial supplies to be listed separately from hand made items. Since I made the patterns/tutorials, but bought the supplies; it makes sense to list them separately. It may seem a little awkward, but I admire Etsy for maintaining their integrity. They are a site primarily for hand made items, and they keep it that way. As I thought about it, it occurred to me that it would be better this way. What if someone wanted 2 kits? Why should they have to "buy the pattern twice"? I want to thank all the volunteers who participated in the testing phase of this tutorial. The majority of them came from the Bead and Button Community Forum. 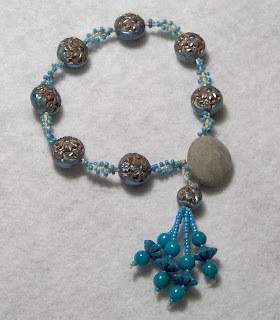 They are a really great group of friendly and helpful jewelry and bead crafters and artists. Except for a few editing tips, most of the feedback I received was very positive. They said it was an easy pattern to follow. One woman reports her 12 year old daughter was even giving it a try after having seen Mom do it. A couple of beaders sent me photos and gave me permission to publish them. So I will. Right here. I think you will agree that both are tributes to skill and creativity. And it was the first time either of them had even tried micro macrame! They both reported that they did not have the recommended supplies, but, as both are beaders, had a bunch of other beads and cords laying around. So they improvised. Beautifully, I might add. Unfortunately for the rest of us, neither of these two beaders has a website I can link to. Hopefully, one day they will. This first one is by Joy Palmer from Adelaide, Australia. This 2nd one is by Karen Conn from Athens, Alabama. What do you think? Did they not do well? Later, when I have some time to work on my Workshop site, I will post them there. I want to have a page photos of projects done by people who used my tutorials. Oh, I am so very excited. These bracelets are beautiful. I really respect people that can make their own jewelry. Well, let me rephrase that I really respect anyone who can make anything. I love to make crafts myself and sold my own jewelry for awhile and it was really fun for me. It was a form of relaxation and self expression. I don't do it much anymore and sometimes I miss, I really should get back to that. Your blog has inspired me!